Before you wax it, Finesse-It. Designed for gel-coat and painted surfaces. Works best when used with a machine polisher. 3M Marine Finesse-It II Glaze removes light imperfections and imparts a high gloss, wet look to fiberglass finishes. Make your boat or RV shine! After compounding or anytime the gel coat needs a boost in gloss, 3M Marine Finesse-It II Glaze is the right choice. This is because 3M Marine Finesse-It II Glaze is designed to remove minor scratches and light oxidation on fiberglass and painted boats. The wax-free, silicone-free formula enhances the shine by actually correcting the surface. The smooth, glossy finish is the result of professional-grade polishing and correction. Once you apply a high quality marine wax, your boat or fiberglass RV will look like new. 3M Marine Finesse-It II Glaze can also be used on newer boats and fiberglass surfaces that have only minor scratches and mild oxidation, or it can be used as a follow-up step to 3M Marine Super Duty Rubbing Compound. 3M Marine Finesse-It II Glaze will act as a finishing polish to remove light compounding swirls and restore an amazing gloss. For the best results, apply 3M Marine Finesse-It II Glaze with a polisher. The FLEX XC 3401 VRG Orbital Polisher or the Porter Cable 7424XP will provide quick, even coverage. Use a foam polishing pad. Buff with a soft Cobra All Purpose Microfiber Towel. Depending on the size of your boat or RV, have several pads and towels on hand. When you're finished polishing, use 3M Marine Cleaner Wax to lock in the shine. 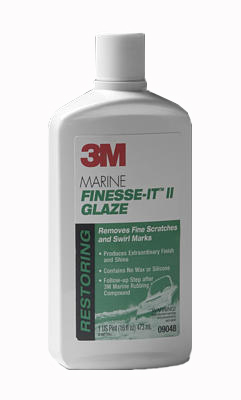 Remember, 3M Marine Finesse-It II Glaze contains no wax so this is an essential step to make your results last.